N/Nn3 & HO/HOn3 & Sn3/Sn2 & O/G? 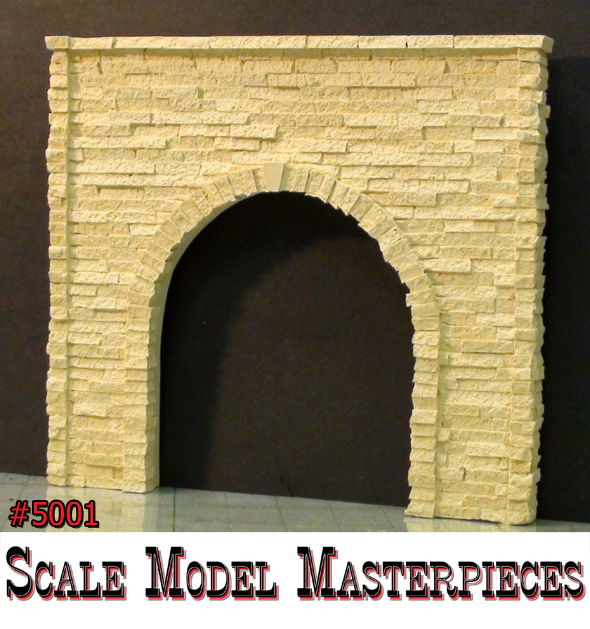 Originally created for the Doctor Ben's Scale Consortium the Scale Tunnel Portal (and some other projects), this Split Granite Interlocking Wall is cast from an original master creation utilizing the Doctor Ben's #8880 (3/32") Baby Building Blocs. Use this Interlocking Wall to make your own tunnel portals, retaining walls, split waters, foundations without spending hours needed to scratch build the project. Simple cut & fit with a track saw & glue together! The overall dimensions of this Interlocking Wall are 8-7/8" wide by 4-5/8" tall and 3/8" thick. Notice that the individual 3/32" BBBs are staggered as not to overlap joints. Please Note that this item is NOT your typical Chooch/A.I.M. interlocking wall. This casting has been crafted with such high tolerances (as casting Labstone will allow) that when interlocked with another wall, the joint is practically impossible to identify. Casting thickness will vary slightly and filing/sanding interlocking finger/opening joints may be needed. Still, that has never been an item available with such an original & unique texture and finish. Want to make your own tunnel portals, retaining walls, split waters, foundations using Doctor Ben's Baby Building Blocs? 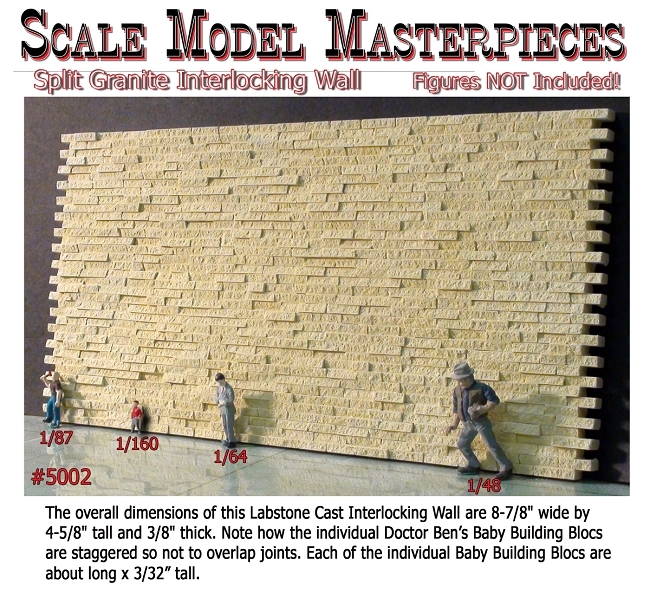 Each 11 ounce box of Doctor Ben's Baby Building Blocs (some colors still available) contains about 36 square inches of wall space when our Blocs are stacked flat as shown in the image to the right. It is very easy to assemble them right out of the box for a rustic finish or trim them with our Doctor Ben's Handy Blade Tool for a more neat arrangement. Are you ready to do some weathering?